Photovoice is a community-based participatory research (CBPR) method that allows individuals to share their experiences and collaborate for change in their community. It is an empowering methodology that encourages participants to reflect upon the strengths and concerns of their environment and document what they see through the use of photos. It puts control in the hands of participants to focus on what’s important to highlight. Not only does photovoice establish a partnership among the key stakeholders, it also involves them in all aspects of the research process. Students will take pictures of their concerns or assets they utilize within the campus community by following the “prompts” or questions each month. All students who submit photos will be entered into a drawing for multiple prizes. What happens with the pictures? A campus exhibition will be held to share the photos collected with the campus community, including policy makers. Participants will engage in critical dialogue, sharing with one another what the photographs mean to them. The facilitated dialogue allows individuals to build upon each other’s concerns, helping shape the identified needs of the campus community. Participants become more passionate about improving the well-being of the campus community. Participants may become campus advocates and participate in policy changes. 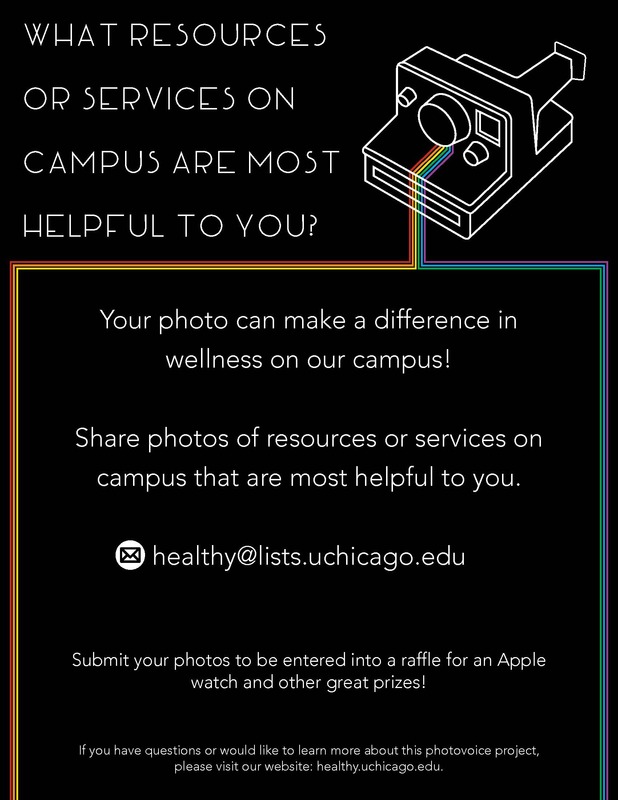 How will UChicago use photovoice? UChicago will use photovoice as a method of obtaining feedback from students for the Campus Themes and Strengths Assessment, one of four assessments being conducted within the overall CHNA. By creating a visual record of the health and wellness conditions of our campus, students will be able to identify campus assets and opportunities for change. What is the theoretical framework of photovoice? Photovoice is an overlap of three theoretical frameworks: empowerment education, feminist theory and documentary photography. All three frameworks emphasize community participation for the purpose of social action.